Surrounded By Surreality marks the long-awaited return to the forest vibes of Finnish maestro Sab Kuch Milegator. 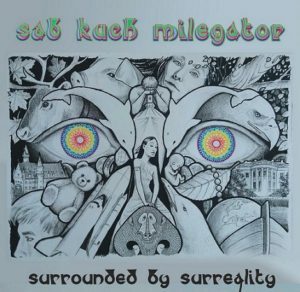 Further developing a hybrid of forest music and Goa trance heard on Kauas Aikain Taa (2016), Sab Kuch Milegator is again beaming you through laughing gas-hazed hysteria into the heartland of mind-melting, surreal forest madness. Mastered by Colin Bennun @ The Stooodio, U.K., with album art by Hilla Österberg and additional art design by Void, Tyhjyys. MP3 Download | FLAC Download | WAV Download · Download count: 13,742. This is so BONKERS. Half way in to the second song im here yelling WOOOOHAAAAAAA…….. It´s bananas. I like it. Definitely unique. Great stuff. Not sure how I missed his previous work but I’m going to check it out now. Another very solid release. This is going to take few listens to fully digest but The Point Of No Yes No has got to be the best track i’ve heard this year. J’ai littéralement joui sur cet album !! épouse moi !!! And please follow my on facebook for updates!